All the cornets except one are standard Bb instruments. 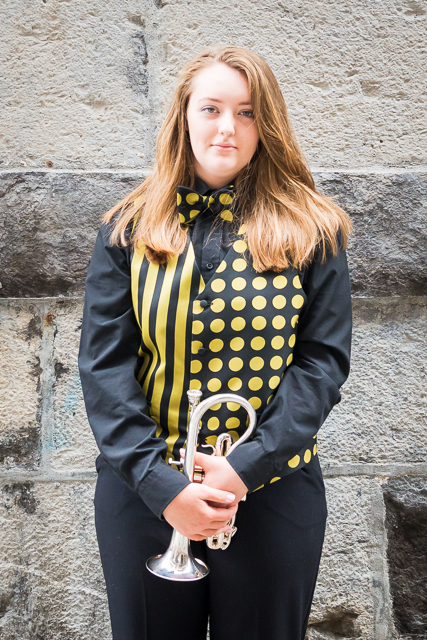 The exception is the soprano cornet, in the key of Eb. The Bb cornets are divided into three sections, the solo cornets (front row), and the second and third cornets (back row). 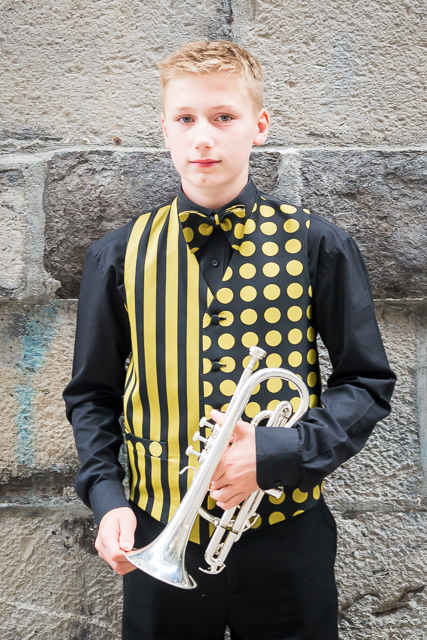 Also, one standard Bb cornet is called the Repiano cornet. In a "standard" brass band, there are four solo cornets, two 2nd cornets, two 3rd cornets, and a Repiano (rep). 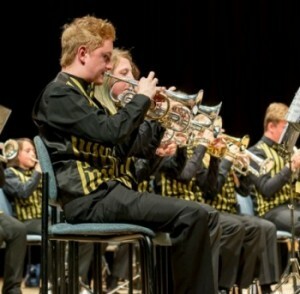 Youth bands however tend to have more than these numbers, Youth Brass 2000 currently has seventeen Bb cornets. 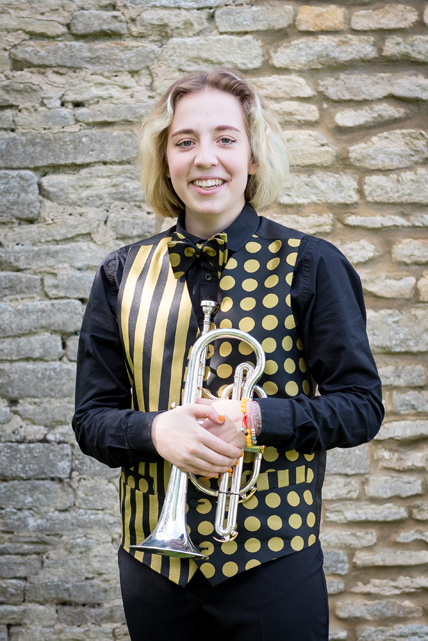 No, not a singer, but a slightly smaller cornet (for the musically minded - in the key of Eb). The soprano - or "sop" can be one of the most demanding instruments to play in a band. The soprano player is the one with the red face, playing all those very high notes that soar over the band, and give it that special "sparkle". The principal cornet is the band's leader. A very accomplished player, he or she gets all the fancy cornet solos, and usually sits on the end of the row in front of the sop. Along with the sop, a very exposed position both visually and musically! He or she is the one that gets to shake hands with the conductor at the end of a concert, on behalf on the whole band! In spite of their name, other than the Principal the one thing these don't do is play solos! These again are standard Bb cornets, and more often than not play the tune, although not all the time. Together, they produce the power at the "top end" of the band, and produce that wonderful "brilliance" that good bands produce so effortlessly. Youth Brass 2000 currently has 6 of these, but most bands have 4, including the Principal. These sit in a row behind the front row. They tend to play the harmony against the front row's melody, or are used to accompany other instruments in the band who have the tune at that moment. Some composers use them as a sort of "alternative front row", so no excuses that you aren't good enough for the front row if your band plays some of these pieces! As with the second cornets, there are usually two or three of them, and again they are used for basic harmony. They often have a simpler version of the harmony that the second cornets are playing. Although this is another standard Bb cornet, and usually sits on the back row next to the sop, the rep is a Jack of All Trades. Sometimes the rep plays with the back row, sometimes with the front row, sometimes accompanying the Principal, and sometimes playing with the opposite side of the band. Sometimes the rep will actually get a little solo! 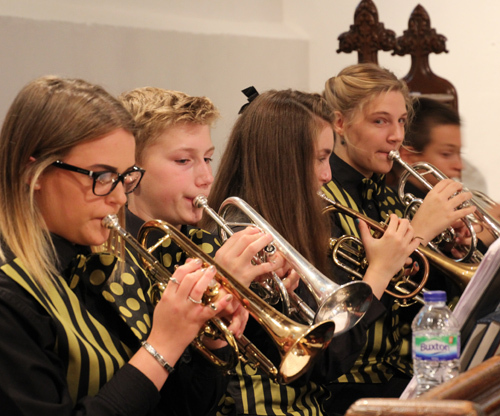 We currently have two repiano cornets in Youth Brass 2000.